Hard skin on your feet can often cause discomfort and be hard to treat. But it doesn’t have to be that way! Amopé has the answer in the Pedi Perfect™. 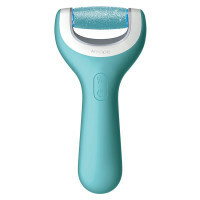 A professional pedicure set for silky smooth feet, the electrical device’s unique roller head gently remove areas of hard skin. Wearing inappropriate footwear can be a major factor in causing hard skin. Regular use of sandals, flip flops or open shoes leaves the feet , which can cause the skin to become hard. Also, wearing ill-fitting shoes can cause friction and dehydrated skin, resulting in hardness and cracks on your feet. By doing this, the skin on your feet should remain soft, and if you do have hard skin, the skin can be softened, making it easier to remove. This can be done normally thorough someone’s bathing or showering routine. Keeping your feet moisturized is also important in preventing hard skin from forming. Amopé Pedi Perfect™ Daily Moisturizer absorbs quickly into the skin to increase hydration. It should be applied daily to clean, dry feet and until the cream is fully absorbed. After soaking, and moisturizing them, your feet should be kept dry. They should be dried thoroughly after showers and wet socks should be taken off as soon as possible. Although hard skin is essentially skin that is overly dry, drying skin after soaking and moisturizing them is important if you do have hard skin so any treatment can be effective as possible. If your feet are not dry when using the Pedi Perfect™ for example, it is likely that it will not remove as much hard skin as it would if your feet were dry before use. Apply Amopé Pedi Perfect™ Extra Rich Skin Recovery Cream before bed and it works overnight, whilst you sleep. Its nourishing ingredients, Such as provitamin B5, provide the skin with long-lasting moisture and help to support the skin’s regeneration, giving you beautifully smooth feet when you wake up. The bonus in doing these exercises is that they can be done virtually anywhere. They can be done whilst sat at your desk at work, whilst relaxing watching TV at home, or whilst on a flight. These exercises help to promote good circulation in your feet. As well as the skin on your feet, it is important not to forget eat well for your bones too. Whatever your age, eating adequate amounts of calcium and vitamin D will help to keep your bones healthy. This may sound strange but it’s an increasingly popular pastime. This activity involves placing your feet in a tank of warm freshwater containing toothless garra rufa fish. It may not be for everybody, as the feeling of the fish nibbling and sucking away at dry and dead skin can be tickling. In the end though, it can leave your feet feeling smooth and free of hard skin. Applying lavender oil to your feet can help to soften the skin on your feet. it is recommended to add 15 to 20 drops of lavender oil to a bowl of warm water and soak your feet for 15 to 20 minutes for best results. Last not but least, the Pedi Perfect™! The roller head comes with finely ground diamond crystals, allowing you to buff away hard skin in an instant, leaving you with fabulous visibly smooth feet. As you can see, there are many paths that you can go down to avoid and tackle hard skin, you just need to find the way that works best for you. Whatever way you decide, be rest assured that soft, beautiful feet are within reach!